While Rosanna Lyons was still a young girl growing up in a small Irish village, her family couldn’t decide if her remarkable artistic talent was matched by her love of dogs. Her talent for drawing was evident at 3 years old, and her love of dogs had begun before the threshold of her memory. 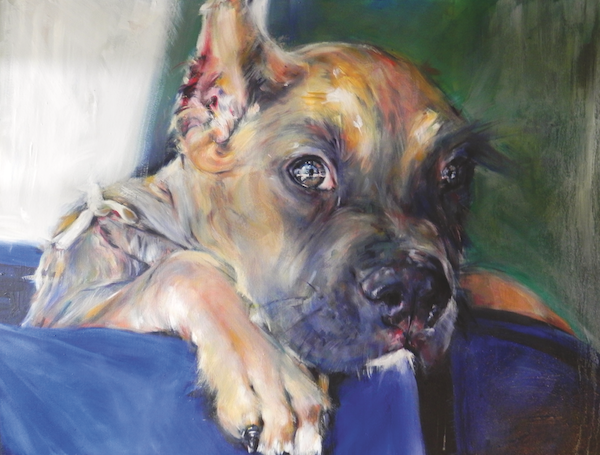 The project goal is to paint studies of dogs who have found forever homes after being abused or abandoned. Her paintings for the project are evocative and seem to capture something that is at once sad, world-weary, and trusting in the faces of the rescued dogs. And she is a masterful artist. Rosanna was accepted to the Limerick School of Art & Design at a very young age. At 17 years old, her studies were cut short when the prestigious animation studio Sullivan Bluth Studios recruited her because of her powerful life-drawing skills. During her career as an animator, Rosanna has created design work and effects animation for Walt Disney Studios, Dreamworks, and Steven Spielberg’s Amblimation studios. She has worked on films, such as The Hunchback of Notre Dame, The Road to El Dorado, and The Simpsons Movie. After working on The Simpsons Movie, Rosanna became the first animator on The Simpsons television series to specialize in effects. Animation work took Rosanna to cities such as London, Paris, Madrid, and Los Angeles and despite her successful career, she managed to study and refine her fine art skills. Now, she said she joined a certain “loose element” she developed as an animator with her fine art skills, such as a strong sense of composition and a passion for colors. In recent years she has focused more on her figure painting, and she has also explored on the canvas her love of dogs and other animals. Working from photographs, Rosanna studies the image deeply for detail, takes the details she finds compelling, and applies some artistic liberties for dramatic effect, often exaggerating features and colors. For emotional effect, she uses strong, undiluted colors and loose brush strokes. She sometimes uses a large housepainter’s brush and switches to a finer brush to add detail. 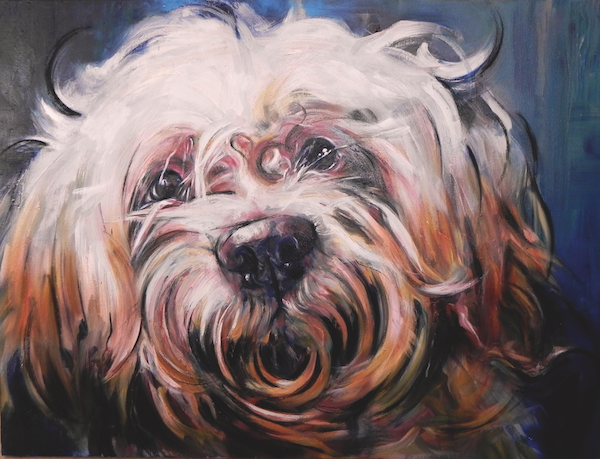 The post A Dog’s Eyes Are the Window to Their Soul for Painter Rosanna Lyons appeared first on Dogster.